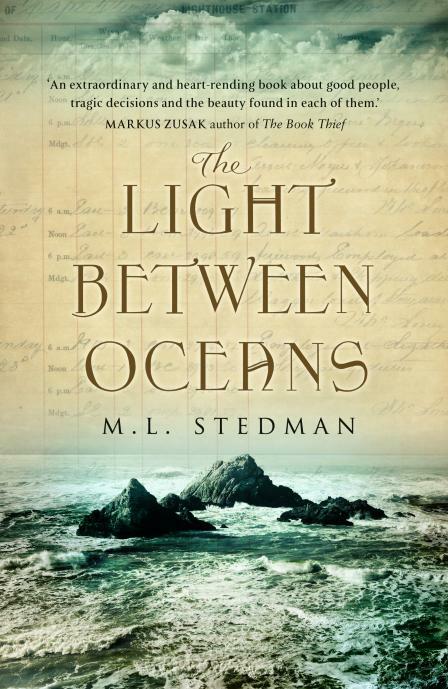 Today I want to share with you my thoughts on the May book of the month: The Light Between Oceans by M.L. Stedman. It's part of Bon's Book Club from The Life of Bon. She's a hoot if you haven't checked out her blog yet I suggest you get on it. So this month's book was The Light Between Oceans and I literally finished it 10 minutes before writing this post. I have to admit the first half was a little slow going but by the time I got to the "good stuff" I couldn't wait to read the next chapter. It's been a while since I've found a book that I couldn't put down, didn't want to end, AND wanted the characters to somehow have a happy ending ... although all three of those seemed highly unlikely. It's based in Australia in the 1920's and takes place mainly on a desolate island lighthouse. I was hooked just on the description of the idyllic fantasy island and the beauty described in the fictitious lighthouse. Yes I googled whether or not it was a real place, sadly it's not. The story line is centered around Tom and Isabel who miraculously find a baby adrift in a dingy on the beach of their private island. They have endured three really tough miscarriages and are desperate for a child. So when one practically appears out of thin air, naturally they think it is a sign from God. Tom is very by the book and wants to report it to the authorities. Isabel is aching for a baby and honestly believes the babies parents to be dead. They decide to keep the baby and raise her as their own but the guilt eats Tom alive for the next few years. After learning the child's birth mother is still alive and she's living in the small mainland town where Isabel is from (AND he's met her years before only never knew her name, small world right? ), Tom just can't take it anymore. He leaves a note saying the child is alive, safe, and loved. Well this sets in motion a series of events, and without giving away all the details, it is truly heart-wrenching. I actually shed a tear or two ten! If you can believe that! I thought the author told a beautiful love story between two people who truly, deep down, loved each other despite the many hardships they faced. To me that is what honest love is about. It's not always happiness and sunshine. Sometimes terrible storms happen and it is how you cope with them that bring out your true colors. Life will either bring you closer together or rip you apart and it all depends on the choices you make. No one is perfect and can never hope to be. Our past makes us into who we are and we can either dwell on the decisions we made or choose to move on and just live with them. At the end of the day the world keeps turning, the stars keep shining, and the ocean waves keep crashing. All the drama that goes on in one person's lifetime can seem so small and insignificant compared to the eternity of the world. I'm excited to check out June's book Matilda by Roald Dahl. I used to love his books as a kid! Who didn't read The BFG? Or James and the Giant Peach? I think we can all agree the man has a knack for writing for kids. I can't wait to read his books to my kids one day. So if you are looking for something to add to your summer reading list, why not join me in this book club amazingness? Thanks! I think I was inspired by how beautifully written this book was! I agree, the book started off slow, but it definitely picked up towards the end! I didn't think to google whether or not the place was real, good thinking! I wasn't the only one apparently because one of the most common google questions regarding Janus Lighthouse was "Is this a real place" haha!